We decided early on that we wanted to create some kind of printed object as part of the Towpath project, something that people could take away with them. Sarah quickly came up with the idea to create an origami narrowboat: a simple and elegant fold that leaves space for text, and fits perfectly with our focus on canals and water transport. One of the first prototypes was a ‘ghost boat’ made from semi-transparent paper, which ended up being very beautiful but structurally unsound. Transparent paper doesn’t like to fold, unfortunately, so we had to leave the ghosts behind and go for something more solid and crisp. Once the right paper was found, the design process involved a LOT of finicky work on millimetre bleeds and text placement. Many, many files passed back and forth until Sarah and Helen had the draft worked out and ready for testing. This was a print project that absolutely required a hard proof copy from our printers. Small blips that were unnoticeable when the piece was flat became glaring once it was folded into shape. It’s got text on all sides, but take it apart and it’s only a few lonely lines on a mostly blank piece of paper. Not much room for writing. As a piece of sculptural literature (is that a thing? If not, I hereby designate it a thing) the boat needed to justify itself not only in form, but also, of course, in content. 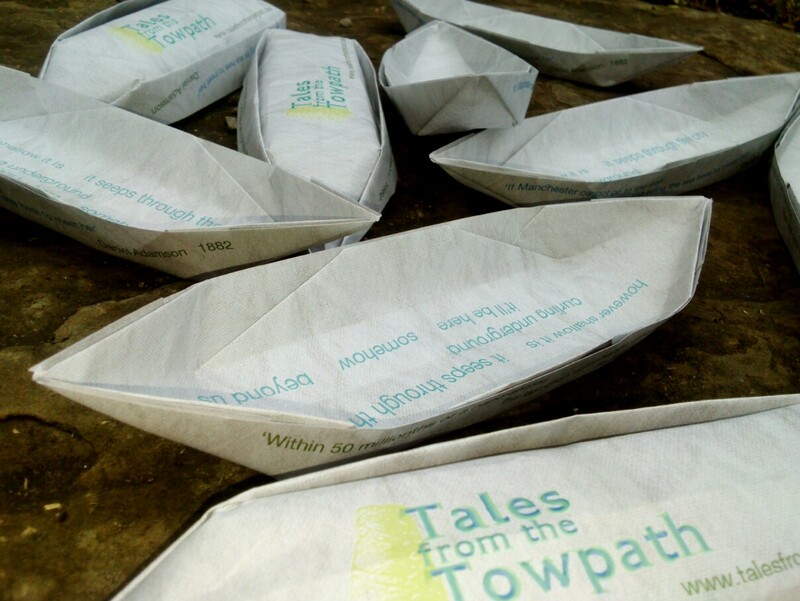 It needed to hold pieces of the story, as well as being coherent enough on its own that it would mean something to people who might not have encountered any other parts of the Towpath story via the trail or the performance. A lot for a small boat. All of this brought us back to the core of the story – an extreme edit, which now sits in the middle of the boat, with quotes from our two main characters running along the waterline on each side. This extreme editing process also produced the surname of one of our main characters – Tib Aberforth – which impacted the performance script, and the trail text. Like the collaborative process we’ve used to write the text, the different formal elements of the project have grown together, influencing one another as the story has emerged. This little boat actually carries far more than its size would suggest. *In the spirit of our collaborative venture, I’m using discussion and notes to write about the piece of the project that was largely led by my co-conspirators Sarah and Helen.